HP Universal Printing PCL 6 is a Printer hardware device. The developer of this driver was HP. In order to make sure you are downloading the exact right driver the hardware id is WSDPRINT/Hewlett-PackardHP_CoFA77. You can download from the link below the driver installer file for the HP HP Universal Printing PCL 6 driver. The archive contains version 61.170.01.18326 dated 2014-06-17 of the driver. Follow the driver setup wizard, which will guide you; it should be quite easy to follow. The driver setup wizard will scan your computer and will install the right driver. This driver received an average rating of 3.8 stars out of 84020 votes. The advantage of using DriverMax is that it will setup the driver for you in the easiest possible way and it will keep each driver up to date. How easy can you install a driver with DriverMax? Let's take a look! 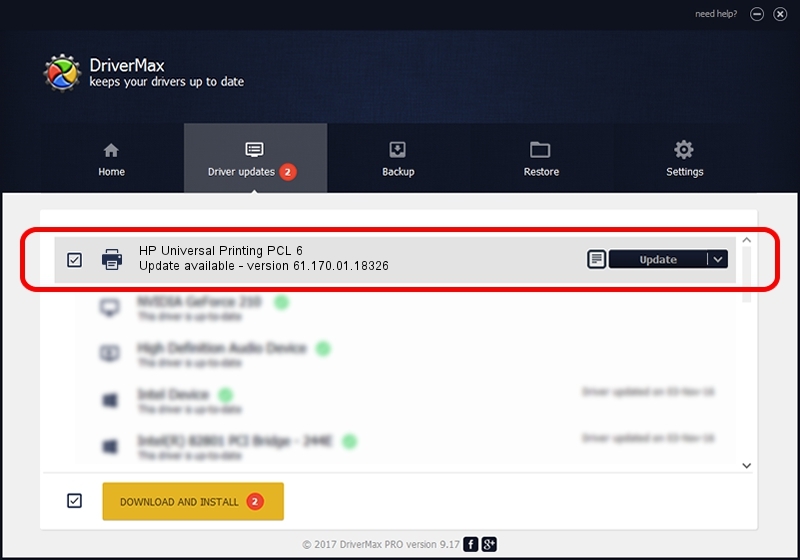 Start DriverMax and click on the yellow button that says ~SCAN FOR DRIVER UPDATES NOW~. Wait for DriverMax to analyze each driver on your PC. Take a look at the list of available driver updates. Scroll the list down until you locate the HP HP Universal Printing PCL 6 driver. Click on Update.